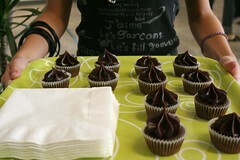 I made these chili chocolate cupcakes (amongst many other things) for the art show/benefit on Saturday. I expected the chili taste to be a bit more noticable in both the cake and frosting, people only noticed it if I told them in advance, but the little buggers were rich and chocolately regardless. I need to work on the cupcake recipe some. I want a richer cake (going to drop the flour content and up the egg) and definitely more spice (maybe more cayenne…) Also going to try to spice up the frosting next time. I wanted to top them with a red hot, but a last minute run over to the nearby grocery store, pharmacy, and liquor store proved fruitless. 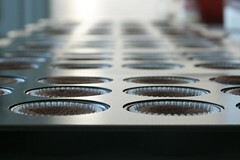 NOTE: Making this many mini cupcakes at once requires a number of pans and a good sized (36″) oven. Next time I try the recipe, I will make regular sized cupcakes, but I am guessing I’d get somewhere around 24… easy to bake off in a normal sized oven. bittersweet chocolate, cream, butter, chipotle chili, cinnamon, orange peel, and lemon peel. I think that adding pepper is awesome, and I add it to all my hot chocolate drinks. It makes the entire chocolate experience more robust, yet elegant. Have you considering dusting the top with some gold powder? The way you iced them makes them extremely divine in appearance and perhaps that would be a lovely touch….or a lemon zest curl. Sorry to babble, it is just that your cakes look (and sound) so freaking awesome! I am completely blown away by your photography and obviously the accomplishment of your baking! I was looking at your flikr site and wondered what the section where people were making silkscreen tshirts was all about. Was that a class you were taking/teaching? I am really interested in doing small scale silkscreening like that and would love some advice. Thanks! Ah, these look fantastic. I wish I could have tasted them. Soon, I’ll try to make a gluten-free verson! Gosh, I love your site. I have a friend who’s obsessed with cupcakes, and she’s going to salivate on her keyboard when she sees this! Hey, Leah. A group of friends have a monthly craft-factory thing and there is a project that someone teaches. That month a friend taught printing, but I don’t know much about it. We came up with designs, traced them on velum cut them out, sprayed the backs to stick them to the stretched out shirts, then rolled the paint over. My friend had taken a class, but I am not sure where. you are absolutely brilliant. absolutely. i love it. Your photos are always fabulous but this latest batch had me obsessed. I made these this weekend for our block party and they were amazing. Hands down the best cupcakes I’ve ever made! I upped the ancho chiles to 3 heaping tbs (next time I’m buying more dried chiles to grind) and they were addictively good. You’ve inspired me to try an ancho chocolate next! 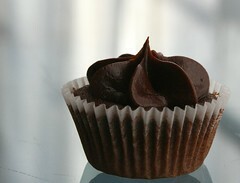 How do you get your cupcakes to have such smooth surfaces, and they all have uniform appearances. When I make my cupcakes, some come out of the oven with horns and others look like shriveled apples. I’d really appreciate your guidance in this matter. THANK YOU! I have had the same happen to me. In my experience, the problem stems from ingredients like butter and eggs not being at room temperature before mixing. So, letting those items sit out for a couple of hours before starting, is one suggestion. And making sure everything is mixed up well. I also use a convection oven now, which I find helps keep the temp even. I made these last night with my husband for Valentine’s Day and they were great. I’m a wimp when it comes to spicy stuff and like things pretty sweet, so I used not quite full tablespoons of the ancho chili powder. However, the spice was hardly noticeable and quite nice, so next time I’ll definitely use heaping tablespoons. I got 27 regular sized cupcakes out of it, and baked them for 21 minutes. The only problem I had was that they fell while cooling. Any idea why that was? I followed the recipe exactly except for using light sour cream and light brown sugar (what I had on hand). Wonderful taste and texture though, and they came out so smooth and pretty. I made these cupcakes but read what you said about not noticing the heat, which is why I wanted to try them in the first place. I used Ancho Chili powder but added about 2 more tbl spoons and 1 tbl spoon of Chipotle chili powder and about a tbl spoon and a 1/2 of cayenne pepper. I was a little nervous using the chipotle but it really didn’t give it too much of a different flavor. I just kept tasting the batter until I was satisfied. I made the frosting as you did. Needless to say I was very pleased with the heat of the cupcake. I also used Hershey’s dark chocolate instead of unsweetened because it was calling my name from the pantry! I brought these to work and had mixed reactions (I expected that) I loved these, they were rich and gave me a nice kick at the end! I was wondering if I wanted to bake this as a cake would I just use an eight inch round pan? We are having a mexican feast for thanksgiving and I thought this would be a great finish!!!! Just wondering..